Identical in concept to the regular Weight Distance plate described on the Weight Distance page, this plate is intended for trucks used primarily on farms, ranches and farm-to-market roads. It has replaced the earlier Farm Truck plate. 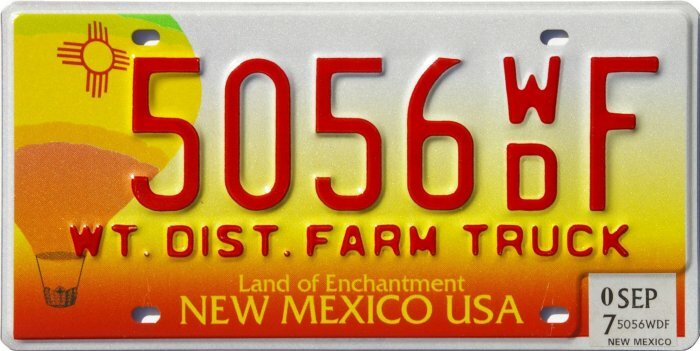 The Weight Distance Farm Truck plate has been issued in various configurations since about 1980, with a common characteristic being a prefix or suffix of WDFT or WDF. Beginning in the early 1990s the embossed words “WT. DIST. FARM TRUCK” were added to the plate. Registration fees are calculated in essentially the same manner as described above for the regular Weight Distance plate.